KUALA LUMPUR (Feb 3): Hours after announcing his resignation as Kedah menteri besar, Datuk Seri Mukhriz Mahathir today said he was now free to speak his mind and expose any wrongdoing committed by the leadership. "I am free. 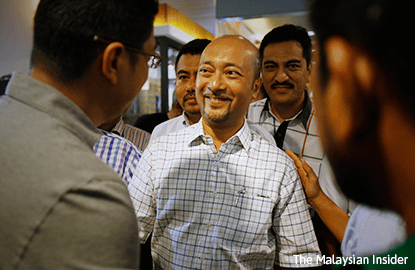 I have no government position, so I can say whatever I want," Mukhriz told reporters upon arrival at the Sultan Abdul Aziz Shah Airport in Subang. He said this when asked whether he would be more vocal, following his resignation, in criticising the party leadership. "I only want to speak out on matters important to the party. So if the leaders commit any wrongdoing, I believe they should be exposed." "We have to talk about those issues, so that our party will be stronger. If we ask the general view of the party members now, if there is no change at the top, our chances of winning in the 14th general election are slim," he said. The political tussle in Kedah ended with Mukhriz relinquishing his MB post with immediate effect today, after losing majority in the state assembly. His arrival at 5.30pm today was greeted by about 50 supporters, chanting "Hidup Mukhriz". He remained calm and smiled at the crowd, as they requested to take pictures with them. Mukhriz resigned as menteri besar this morning, ending the tussle in the state that began when Kedah Umno declared on Jan 20 that they lost confidence in his leadership and wanted Najib to intervene. Datuk Seri Ahmad Bashah Md Hanipah, who led the press conference, will be sworn in as menteri besar tomorrow.